The boys still had smiles after many hours of harvesting. It was a busy weekend of harvesting and a few long days out in the garden. 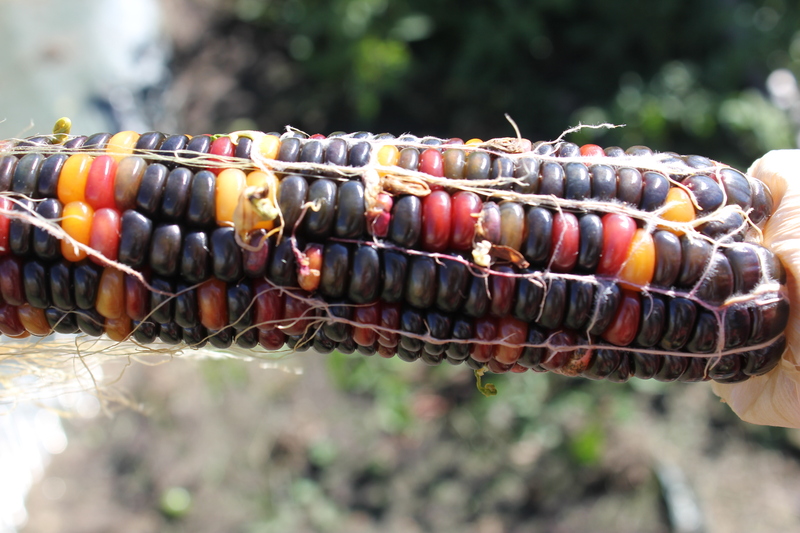 At one point as we were peeling back the husks on the ornamental corn Sam said, “Boy this is actually fun!” Every ear of corn unveiled a different surprise and fun colors. The boys were out with us the entire day. You may wonder how we kept everyone motivated. Three keys were: music, machines and food! Cranking the music was a motivator in the field when I was young, and it continues to make the field work more enjoyable and entertaining today! Machines always motivate boys because my boys are always interested in cool machines. Machines also help to ease the work load. This work is hard enough so anything that can improve efficiencies is a great thing! I try hard to make some of their favorite foods for snack breaks and meals to help make the experience more enjoyable and to serve as a good motivator! I remember that my mom worked hard to do that for us, and it was very helpful. It also makes you feel loved and appreciated. I also remember working for some of our neighbors. You would have thought snack/lunch breaks were another meal time, and the food was always amazing! It is hard for us to believe that the growing season is coming to an end. Mother Nature reminded us of that with its cooler temperatures last week. While we didn’t see a frost at our place, all you needed to do was look at the low-lying areas immediately around us to see that those areas did receive a frost putting an end to the growing season on those areas of the plant. Look forward to a full box next week as we continue to harvest the crops! 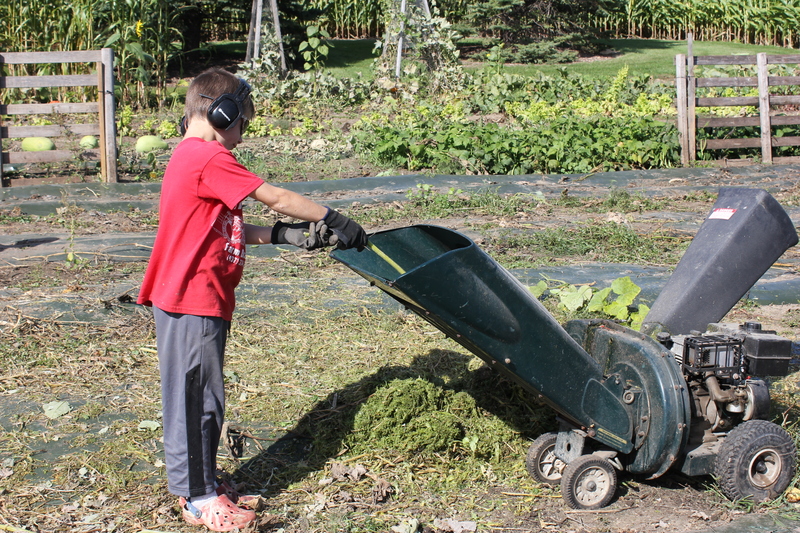 We used a mulcher for the vines and stems so that they would break down and incorporate into the soil for organic matter. The cats have been quite entertaining. 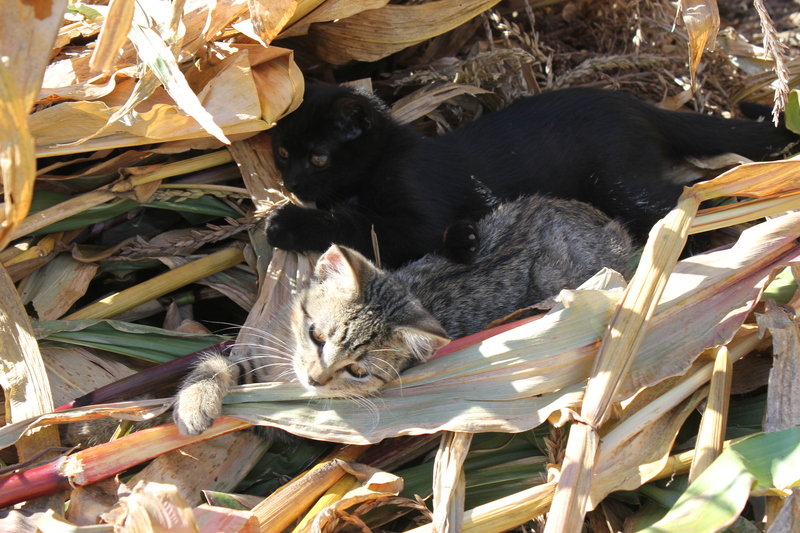 I caught them playing in the corn stalks. Reminder – Next we is the last week of the CSA boxes. This is longer than your contract stated due to the interesting growing season! Carrots – A few to try – more should be ready next week! Broccoli – Some interesting facts from Americas Heartland. Tomatoes – Baby Boomer cherry tomatoes, Big Mamma, Sunny Boy (yellow), Honey Delight (small yellow) and Fourth of July (medium red) and cherry tomatoes – Let us know if you need some tomatoes for canning. We ask for canning amounts that you give a free will donation. Onions – Walla Walla, Snow White, yellow Candy and Giant Red Hamburger (purple) – We pulled this crop this weekend and are drying the remaining onions. Potatoes – Red Pontiac – the link is to more potato basics and recipe ideas. Masquarde Potatoes – A tasty potato that everyone in our house is excited to eat. Purple Majesty – I used these as French fries this weekend. I cut them into French fries and place in a bowl of ice water for about 20-30 minutes. Then pat dry and place in the deep fat fryer. Spaghetti Squash – Choice of squash. Either Spaghetti or Carnival. Here is a recipe for Spaghetti squash from the Pioneer Woman and Taste of Home. The Carnival squash has a thick exterior and has spotted and striped colors of white, orange, yellow and green, depending on its level of maturity. The presence of post-harvest green coloring indicates that the squash is still at its peak maturity. As the squashes ages, it will eventually only maintain orange and cream colors. It is semi-dry and firm in texture, fragrant and its flavoring, mild. The squash’s true flavors only emerge once cooked. Then its flesh becomes richer, buttery, nutty and sweet. Carnival Squash – Choice of squash – see above picture. This squash has a nutty mild flavor and reminds me of an acorn squash. Sweet Corn – Thank you to FarGaze Farms for this partnership in growing the sweet corn. Enjoy! 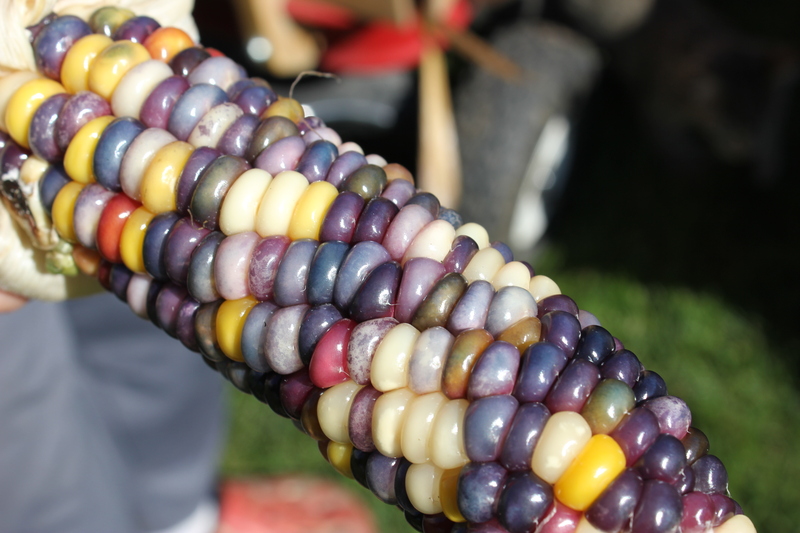 Here’s an interesting link about sweet corn research from America’s Heartland. Melons – A variety to choose from. Let us know what you think! Unfortunately we had some interesting Mother Nature challenges here as well which prevented us from having more for each of you. We hope you enjoy this sample, and we hope that next year will provide better opportunities for all of us. Some of the broom corn was 12 feet long. We cut it down to 8 feet so it was more manageable for you. 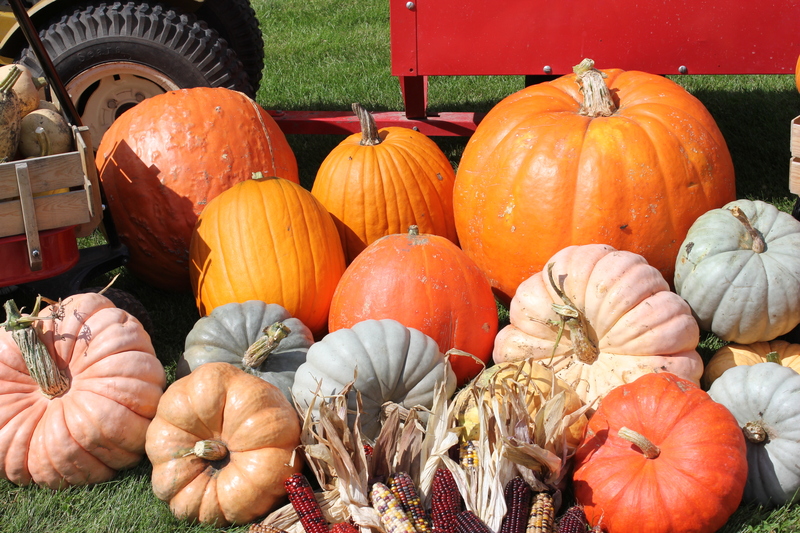 A variety of pumpkins to choose from. 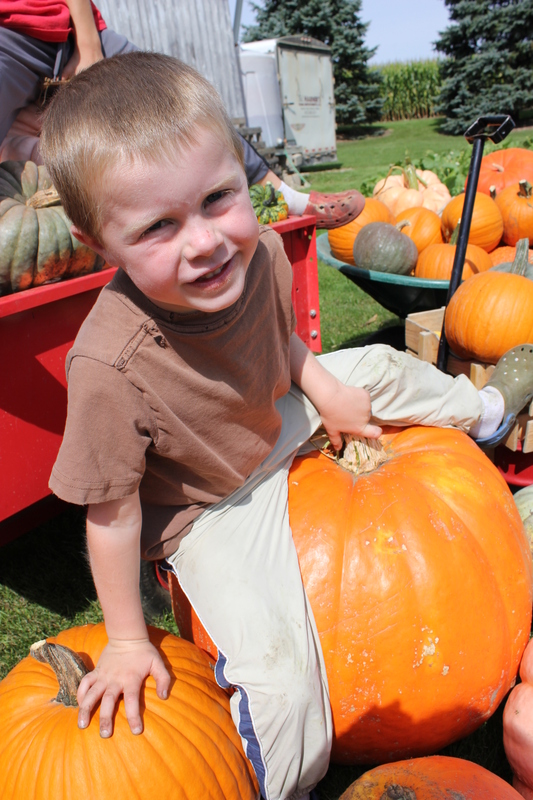 We tried some pink pumpkins this year and were pleasantly surprised with their color and weight of this pumpkin. This ear of corn had a number of kernels sprout and start to grow new corn. Why? Well if the ears of corn didn’t “drop” when fully mature moisture gets into the ear of corn and causes this to occur. “Drop,” in this case, means that the ear of corn is still attached to the stalk but instead of the plant holding the ear in the upright position, the ear of corn now faces the ground instead of the sun. If you look really closely, you will see small dots on these kernels of corn. The dots are where the silk or the female part of the plant attached to the baby kernel of corn. In other words you could think of it like a belly button. The connection of the female part of the corn, silk, to the baby kernel. 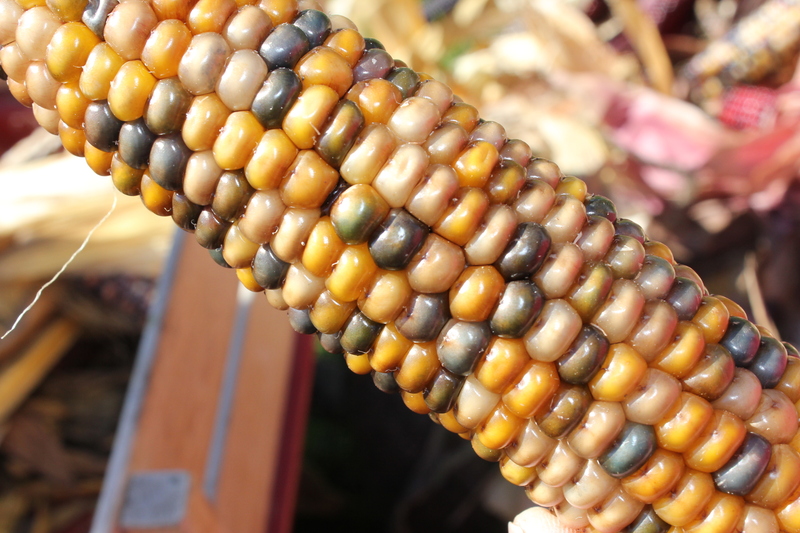 These kernels had a unique curve pattern going around the cob of the plant. Beautiful color as well! Lefse is a family favorite and is part of my family heritage, a cultural food from Scandinavia. I remember making lefse throughout my life and love sharing this with our boys. I am thankful that I have a husband that also loves this food. After all of our hard work, there were a few potatoes that were stabbed by the potato fork. I used those potatoes to mix up some lefse. On Sunday, afternoon we brought out the lefse grills. The boys couldn’t wait! This is a family tradition on my side that we are excited to pass down to the next generation! Mash together the above ingredients. Place in refrigerator to cool for at least 4 hours to 24 hours. When cool add 3/4 cup flour to every 1 cup potatoes. As potatoes get colder use less flour. Mix together and form into logs. Cut each potato log into 4-5 pieces. 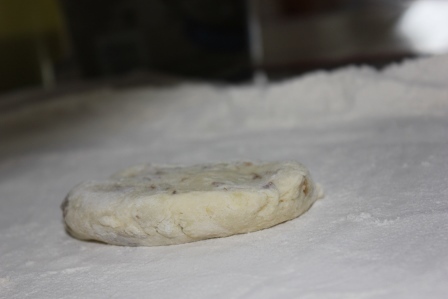 Roll out like a pie crust to about 1/4 inch or thinner. Fry on grill heated for 425-500 degrees. 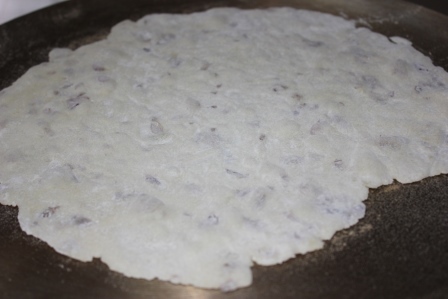 Lefse will look similar to a quesadilla. Spread with butter and sugar and roll up. Enjoy! Potato lefse begins with mashed potatoes mixed with butter, cream and sugar. We use our “misfit” potatoes. Potatoes that were odd shapes, really small or that we stabbed with the potato fork while digging. 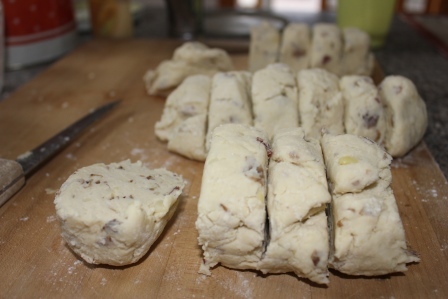 After mixing together the cold potato mix and the flour, the mixture is shaped into logs and cut into about 5 pieces. The balls of potatoes are flattened out, shaped into circles and rolled out until they are about 1/4 inch thick. Using a lefse stick, they are then gently lifted from the pastry cloth and rolled out onto a lefse grill. We have two grills. One of our grills is my Grandma’s. Our lefse sticks also hold meaning. Some are from my Grandma. Keith noticed Grandma’s signature on his. Steve has also made a few and another is from a family friend. The sticks are used to gently pat bubbles out of the lefse as it is cooked and then used to flip the lefse over to grill each side until light brown spots form. Once cooked on both sides the lefse is placed between a couple of kitchen towels and wrapped up to prevent the edges from drying. When all the lefse is cooked, the stack of lefse is quite high! Making lefse does take some skill. 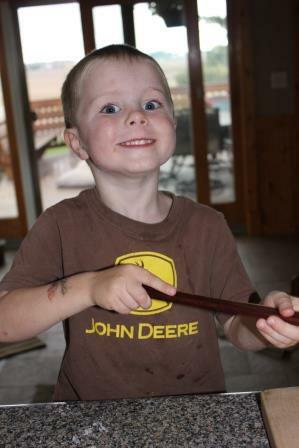 This is how proud Sam was after flipping his lefse on the grill. 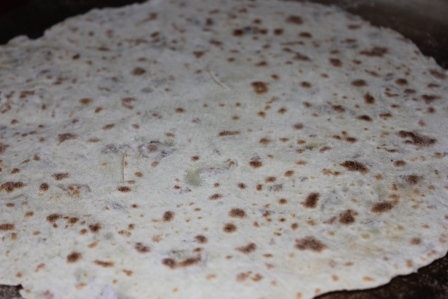 The biggest reward … the awesome taste of fresh lefse with butter and sugar on it and rolled up. We love it! We then package it up into Ziplock bags and freeze. Thaw out as needed and enjoy! 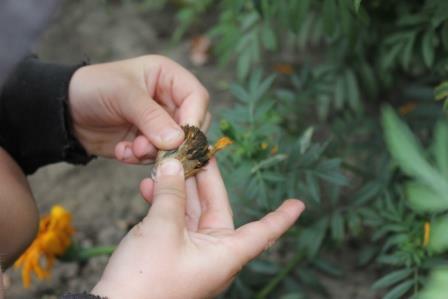 We planted Marigolds this year to see if they would draw beneficial insects into the garden to eat potato bugs. I think they may have assisted a little, but not to the level that we needed. As we clean out the garden, the boys have had some interesting questions. One that I find the most interesting is…”Why are we done for the year?” This is amusing. It wasn’t more than a few weeks ago that we were trying to do our best to be encouraging and trying to find creative ways to make sure they were helping, learning and having fun. 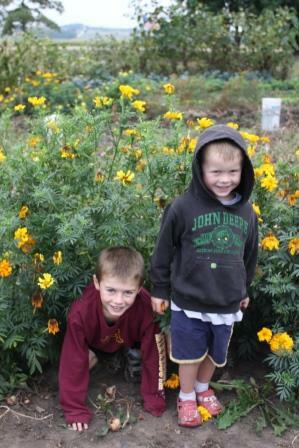 This year’s lesson during the growing season for the boys… “If we work together, we have time to play together.” We set the timer for a 1/2 hour to complete a garden project together, and when the timer went off, we would play baseball or football together. So as we wind down, I thought it would be fun to make a Harvest Feast meal for the kids. Keeping it fun, providing encouragement to finish off the project and a celebration for the work that has been accomplished. Below you will find the first in a series of recipes used for the Harvest Feast. Once the Marigold flower dies, the dead, dried flower and the seeds within are left. 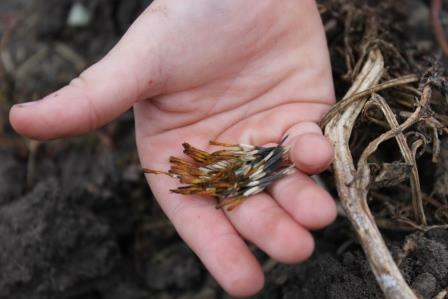 The kids were amazed at how many seeds were found in just one dead flower. It will be interesting to see how many Marigolds re-seed themselves next spring, and if we have an increase in beneficial insects for potato bug control. 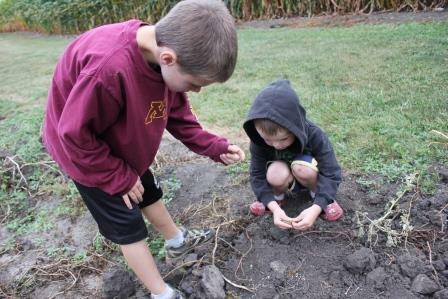 The boys had fun planting the seeds in different areas of the garden and watching them grow. It was fun to share this science with the children in this year’s CSA. Seeds can be kept until next year in a paper envelope and planted next spring. The balls of potatoes are flattened out, shapped into circles and rolled out until they are about 1/4 inch thick. Making lefse does take some skill. This is how proud Sam was after flipping his lefse on the grill. 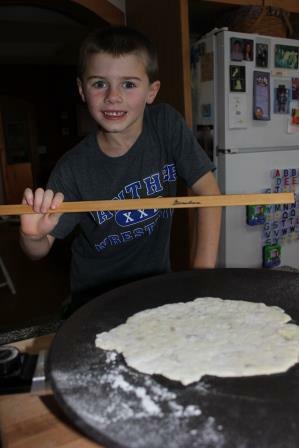 The biggest reward … the awesome taste of fresh lefse with butter and sugar on it and rolled up. We love it! We cooled we then package it up into Ziplock bags and freeze. Thaw out as needed and enjoy!